The Tenth Annual PA Randonneurs Fléche was by most accounts a success. All of the nine registered teams eventually made their way to the Weisel Hostel. Seven of the teams arrived on their bikes in the allotted 24 hours. First to arrive at the Hostel was the Fleshe Eating Rumble Ponies, nee Quesadilla Quest, by virtue of it early starting time. The team reprised its most fléche-like route from Binghamton, NY and wins the award for most ambitious team. This award is not based on mileage, but riding conditions. The team started out on Friday afternoon with snow still flying and rivers still overflowing. By the second hour the team was on alternate routes when the primary route was discovered to be several feet under the raging Susquehanna. Cold temperatures, more snow, and plenty of mud couldn't keep the team from finishing this year. Said Captain James Haddad at the finish, "It was a true adventure." Three out of the four members of the 2016 Quesidilla Questers reunited this year to attempt another Binghamton to Quakertown Fleche. After last year’s DNF, Zach G. and James H. were both seeking their first successful fleches. Fleche veteran Chris N. also returned to rematch the challenging terrain of NE PA, this year joining the team suitably early enough to bring his wisdom and experience to the route planning process. Pete B. joined the team for his first fleche attempt. Ignorance may have been blissful as Pete remained silent while a hundred plus emails circulated debating the planned route, but when the time came, he began to understand why it took the team so long to plan. Challenges came early and often for the FERPs who had already elected to ride Friday into Saturday so that James could make it to church for Palm Sunday. As the route began to take shape, the rains began to pour. The Susquehanna river rose and closed SR 1010, the Lackawanna river impeded rail trail travel and the Delaware river blocked another of the team’s roads. Master route planner Zach prepared nearly 50 miles of possible detours and alternate routes to deal with the inclement weather and sluggish trail conditions. At 1 pm on Friday, the team departed Nezuntos Café in Binghamton with light snow and 35º temperatures. 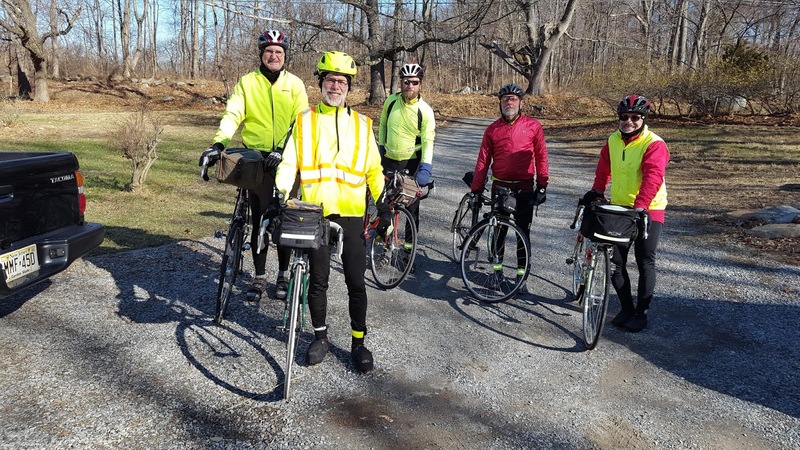 Progress was quick as the team followed the Susquehanna river east until Lanesboro, PA. Progress slowed as the team began an 800 ft climb on a dirt road that more closely resembled a flooded trail. 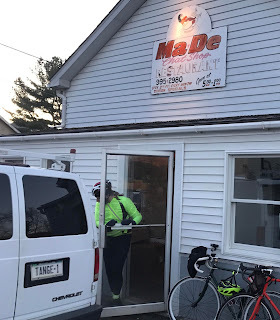 After a climb that could only be described as epic, the team was rewarded with fresh pavement for the descent to the Delaware River and their first controle in Hancock, NY. A quick convenience store stop refueled the team in preparation for the climb out of the Delaware River Watershed into the Lackawanna River Valley and controle 2 in Scranton. The team battled a mix of mud and rock with just a few paved roads as they climbed to over 2000 ft of elevation. At the high elevation, strong winds blasted the FERPs with a nasty mix of wintery precipitation as temperatures dropped to 26 ºF; unprepared for such conditions, water bottles began freezing as the team began their descent into the Lackawanna River Valley. A quick stop at a bar for hot water rejuvenated the riders as they continued the descent with images of a warm diner dinner in their heads. After a delicious and warming meal, the team began the long steady climb out of Scranton towards Moscow PA. After the afternoon’s experience, temperatures in the low 30’s were a welcome change. Progress was slow as they climbed again to over 2000 ft to traverse the Pocono Plateau. Chris had been hurting since the descent to Scranton, and unable to completely recover at the diner, he began falling behind. Eventually, he left the team and headed to a hotel. The remaining FERPs were saddened to lose a teammate, but were thankful for Chris’ contributions, without him, they’d probably have been washed away trying to ford a stream or buried in mud on some dark rail trail. Descending from the Pocono Plateau placed the team in the Cherry Valley, the edge of familiar PA randonneurs territory as the first signs of light appeared on the horizon. The FERPs began racing towards Portland Bagel, where, despite being a bit crunched for time, they ate a much-needed meal and warmed up. Back on familiar territory, the team made rapid progress, covering the distance to their 22 hr controle fast enough to bank 45 minutes for another quality meal. Despite the steep climbs from Reigilsville back to the hostel, with full bellies and confidence in a successful finish they raced back to the hostel, comfortably finishing around 12:30. The Fleche Eating Rumble Ponies would like to thank Andrew Mead and all the PA randonneurs volunteers that make wonderful rides like this possible. First to arrive on Sunday morning was the Fistful of Xanax team under the guidance of Chris Slocum. 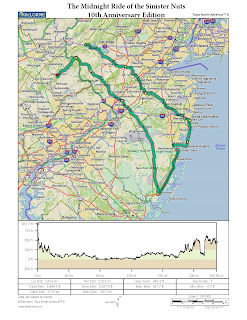 The team modified it's traditional route to start near Quakertown and solve some of the logistical issues of pre- and post-ride transportation. All team members looked in good shape upon arrival. All commented that low temperatures in the final hours approaching the finish were "much colder" than they expected. Hot on the wheels of Team Xanax was the three member team from the west under the guidance of Eric Keller. Eric's route also emulates the more traditional "arrow" by traveling generally east from the State College area. After years of hoping for a break in the weather, the three-member team enjoyed mostly tailwinds for its ride. Snow was reported at the start as late as the day before the team started, but that didn't seem to hamper its progress. Next to arrive was the Fléche Mob under the direction of Rudi Mayr. This was another team that adjusted its route to start near the hostel to reduce the post-ride transportation problems. A Flash Mob is a group of strangers who come together and do something that surprises and mystifies onlookers, so (judging by the faces of and of the people we meet on our ride) our team name seemed appropriate. Starting not a mile from my home, we had a welcome tailwind all the way to the Jersey Shore, and it still seemed to be behind us as we rode south, but proved nasty when we turned west. After a restful dinner at Lower Bank Tavern –the folks there welcoming as usual—we rode up through the Pines, the moon shining brightly behind the trees, the wind having vanished. The road from Glass House to Mount Misery is a narrow and broken stretch of uneven pavement, and its prodigious puddles made for a bit more adventure than the team expected, but the real surprise was the cold. It was much colder under the pines than out on the wide roads! At the Wawa near Brown’s Mills, a young man assured us we were “touched,” his manner so earnest that I almost thought he meant it as a compliment. Burlington County’s farmland proved quiet and lovely in the moonlight as we rode up to Bordentown, where we staked out a corner both at Denny’s for a welcome rest. Our final controle, the Point Pleasant Food Store, did not open on time, so we sent another post card and headed on our way. I don’t think I’ll use that place as a controle again. All in all a great ride! I am thankful to have found a team that worked so well together. No flat tires, only a couple minor mechanical issues. Not much wildlife to report; some deer at twilight, and some rabbits surprised by the headlights. Team member Jeff Lippincott provided a great accounting of the adventure in his blog, jlippinbike. Rudi's photos are also posted. Which is what this team consumed on its looping route that was strategically arranged to pass a number of well-known watering holes. In a true moment of brilliance and overachieving, the team members converged on the hostel early Saturday morning, parked their cars, and then rode the 16 miles to their START at Mueller's Too restaurant. Some team members surely questioned the soundness of this reasoning as they battled headwinds for the majority of their ride. Upon arriving at the finish, Bill Fischer made only two comments: "wow, it's cold out there," and "that route rode really tough this year." Only one individual has managed to start and complete each and every fléche organized by PA Randonneurs: Bill Olsen. Congratulations on this accomplishment, Bill. Once again the band of Sinister Nuts took a looping tour of southern New Jersey on their fixies. Only limited use of the 24-inch gear was reported. Looking to add a little variety, the group moved its 22-hour control from the familiar Mueller's Too to the Ma-De Chat Shop Restaurant in Milford. The team reports the food was good. Team Escargots notched another successful fléche finish with a team of seasoned veterans, including now eight-time PA fléche finisher Dawn Engstrom. Captain Chris Newman stepped in to replace the original captain Paul Shapiro when a personal commitment conflict was discovered shortly after routes were submitted and safely guided the team through the tough neighborhoods of Camden to reach the hostel in fine form. Escargots Volants, like team Now You've Gone Too Far enjoyed tailwinds for the early going on Saturday and reported that winds subsided substantially as they turned north and west for the return to Quakertown. Unlike teams with routes that benefited from the prevailing westerly winds, Chiots Errants had the distinction of having the most westerly miles of all team. And they suffered accordingly. It took its toll and lead to the team arriving at the hostel nearly 2 hours after the cutoff. We applaud their perseverance. No sugarcoating: We had a rough ride. I got a rear flat before we even left Philly; upon replacing the wheel back into the frame, I noticed my hub was terribly loose. Stoop repairs at Ryan's house off-course. By the time we got rolling again, it was already 10:45 AM and we would never be able to make this time up. We battled cross-winds and much busier traffic through Chester and Delaware, only to face the direct headwind the entire way from Little Britain to Hershey. Ryan's SRAM shifter met the same fate mine did two weekends ago, forcing him to ride 150 miles on a two-speed, but he did it with a smile on his face! I had to nurse a slow-leak going into Hershey, plus my failing body and morale. The winds died down overnight, just in time for us to climb slowly in the dark over the next 100+ miles to the Delaware River. An I-78 closure shoved 18-wheelers alongside us on Old 22 for what felt like an eternity approaching Shartlesville, and temperatures seemed to plummet right at dawn getting into Allentown. We reached Muller's at 9 AM, and shed some layers before climbing up to the hostel. So glad to be finished; better late than never. Each brevet is its own learning experience, and I think I learned a lot during this ride. Like the importance of having a well-maintained bicycle, or how only an hour or so can drastically change the traffic patterns through certain segments, or how light rain would probably have been much more preferable to relentless wind. That being said, I also learned that part of being a seasoned randonneur is knowing when to call it and get back to the real reason you're out there: to enjoy the ride and share an unforgettable experience with your teammates. CJ's pictures can be seen here: https://goo.gl/photos/Mj1Aq8w9qS3YmkAm6. At some point during the ride, the team members decided that they weren't having fun any longer. A slow start had them behind the clock and plummeting temperatures promised a miserable evening. Wisdom prevailed and the team call it quits in the evening while they could easily get to a member's house. In true rando camaraderie the team appeared at the hostel Sunday morning to greet fellow riders and retrieve their vehicles. Congratulations to all riders! Special thanks to Jane Brown and Jim Holman for taking on the task of preparing food enough for 40 people and showing up at the hostel by 6am to get everything set up for the arriving teams. Thanks also to Len Zawodniak and Chris Nadovich who also helped with the logistics of feeding the hungry masses and cleaning up afterward. The fléche could not happen without the effort of people like this. Be sure to thank them the next time you see them.